Ninja Tune producer and head designer DJ Food, who we featured this spring for his album The Search Engine, has just unveiled a project very close to our hearts: a tribute album to the 1989 classic Paul’s Boutique, the Beastie Boys best album and one of the Top 10 Albums Of All Time (yup, no hyperbole there). A watershed moment in hip-hop, and unarguably the most complex sampling album ever, this is a great ode to Paul’s Boutique. “3 years in the making, 3 DJs working with over 150 tracks to recreate one of the seminal sampling albums of all time, at last Cheeba, Moneyshot and I can reveal Caught In The Middle Of A 3-Way Mix,” says DJ Food. 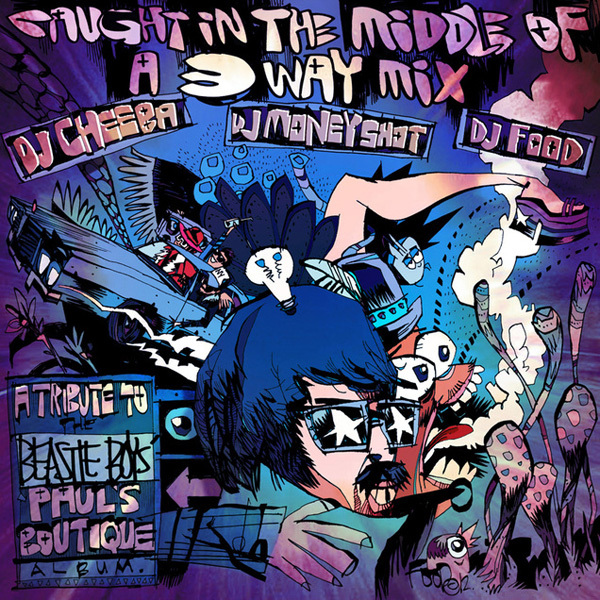 “Our tribute to the classic Beastie Boys album Paul’s Boutique remixed and re-imagined from all the original samples plus a cappellas, period interviews and the Beasties’ own audio commentary from the reissued release.” Add to all this goodness is the fact that cover art above was done by longtime LIAS friend and awesome illustrator Jim Mahfood (aka Food One) and you have a can’t miss project. Of course, there’s one more nice touch as explained by DJ Food: “The mix was over half way finished when we heard the tragic news of Adam Yauch‘s passing this May so this is also our nod to his memory, RIP MCA.” The mix debuted on Solid Steel via Strongroom Alive — you can find a full version with commentary and additional mix action from Coldcut and PC after the Jump, or just listen to chat-less mix below with a download option. Enjoy!